Shipping Corporation Of India (SCI) Limited is going to conduct walk in interview for the post of VTS Supervisors for Kandla Port Monitor Station on contract basis for a period of 24 months extendable by one year at SCI’s discretion. 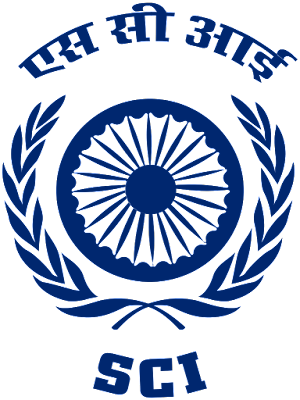 The Corporation is a Government of India Public Sector (भारत सरकार सार्वजनिक क्षेत्र) Enterprise with its headquarters in Mumbai that operates and manages vessels that services both national and international (राष्ट्रीय और अंतर्राष्ट्रीय) lines. For more info about SCI Recruitment like as post name, education qualification, age limit, pay band, selection process, how to apply, walk in venue, important dates etc are given below. Education Qualification ->> Applicants must have pass certificate of Competency as Master Near Coastal Vessel (N.C.V.) or Master (FG) (b) Five years Sea-service of which one year shall be as the Chief Officer of the Near Coastal Vessel (N.C.V.) or Master Foreign Going (FG) Vessels. Maximum age is 62 years. Pay Scale ->> Selected candidates will get Rs. 1, 10, 000 per month ( All inclusive-CTC). Leave Policy ->> As per the SCI Notification, applicants will get 30 days leave for a contract period of one year and pro-rata for the period of extension. Selection Process ->> Selection of the candidates will be done on basis of their performance in walk in interview. Individual for Shipping Corporation Of India VTS Recruitment should be medically fit with good health, normal vision without any hearing impairment as you will be required to undergo a company’s medical check-up at Mumbai prior undertaking appointment. How to Apply ->> Interested applicants who are going to apply for SCI Recruitment they need to download application form through official website of Shipping Corporation Of India Limited that is shipindia.com & attend walk in interview with their caste certificate, educational certificate and other relevant important document at the respected address and correct time.